It appears that this information was incorrect, and I apologize to the Burlington Revival leaders for this. At the time, I had no reason to doubt the communication that was provided to me by a sincere and careful pastor. Some will gleefully use this against me as an excuse to discount everything I have said, but I would guess that every preacher reading this has made mistakes during public preaching or on your blog, etc., and I ask for the same mercy and patience that you would ask for yourself. Let me also take this occasion to say that I do not apologize for the warnings about the Burlington Tent Revival. I have heard from a wide variety of defenders and have considered the challenges carefully and prayerfully. I have continued to pray much about the matter. I have done further research into New Hope Baptist Church of Burlington and other aspects of the revival, and I stand 100% behind my warnings. Over the past 10 years, I have become convinced that unless there is a dramatic, deep-seated, far-reaching change in the average Independent Baptist church, that the vast majority will be contemporary-emerging within a decade or two. What happened at Burlington, even at its best, did nothing to change this fact. Take New Hope Baptist in Burlington, North Carolina, for example. It is a conservative, sincere Baptist church. The dress is conservative. They don’t preach false doctrine. They try to reach souls for Christ. They have all of the typical programs, such as Sunday Schools, youth ministries, and missions support. They preach holy living. They have special prayer meetings, which is more than most churches have today. There are doubtless many sincere and godly saints in the congregation. I have no doubt that the pastor is a sincere man who knows and loves the Lord and truly wants to see spiritual revival. We have the same Lord and Saviour. We have the same Bible. From the bottom of my heart, I thank the Lord for every good thing that is in this church, and there are many. But all of the good things that this church represents are not sufficient to make it the church that it needs to be today to build the type of individual saints, families, and youth disciples we need, and it is not sufficient to stop the slide toward the contemporary-emerging church. - Contemporary Southern Gospel and general carelessness and ignorance about the music issue. In the case of the churches that participated in the Burlington Revival, they say they are opposed to “contemporary Christian music,” but they love contemporary Southern Gospel. They don’t love the Gettys; they love the Gaithers (or people like the Gaithers). But there isn’t two cents worth of difference between the world of contemporary worship and the world of contemporary Southern Gospel. It is fleshly music that gets the people emotionally addicted to honky tonk, ragtime rhythms and even pure rock & roll. Southern Gospel also yokes the church’s people into association with the likes of the Gaithers and the National Quartet Convention crowd, and a more radically ecumenical crowd does not exist. The Burlington crowd got offended at my suggestion that they are ecumenical, but anyone who is hooked into Southern Gospel is holding hands with and playing footsie with ecumenists and is on a fast road to full-blown ecumenism. In a recent message on “How to Continue in Revival,” Pastor Randy Hobbs of New Hope Baptist Church said, “In too many churches you can’t tell the church song from the Honky Tonk.” Not being properly educated about sacred music, and not being willing to get educated with material that is readily and even freely available, the pastor doesn’t understand that he is talking about his own church. About 20 years ago I preached at a church in Cowpens, South Carolina, and the music was raucous honky tonk S. Gospel powered by a white-haired grandmother pianist that would put any 1920s barroom ragtimer to shame. After the service, the elderly pastor asked me what I thought of the music, and I replied, “It is boogie woogie.” He exclaimed, “I don’t want boogie woogie.” I said, “That’s what you’ve got, pastor.” I never heard from him again. There is not any significant difference between rock & roll and the specials that are sung at New Hope and the music that is sung by visiting evangelists such as C.T. Townsend. Having been born and raised in the South, saved in the South, educated in the South, and begun preaching in the South, I have watched as Baptist churches there have grown ever weaker over the past 30 years, and one of the major reasons is the influence of Southern Gospel and the worldly, ecumenical baggage that it carries. I refuse to have anything to do with it. Even 20 years ago, I wouldn’t have preached in the church at Cowpens had I known what their music was like. I feel much stronger about this today. - Biblical shallowness in the preaching and in the lives of the people. I have listened to the preaching, and it is not the type of preaching that builds people up in God’s Word. Those who sit under this type of preaching do not grow strong in Bible knowledge. They are not even accustomed to trying to learn something new from the sermons, because there is not much biblical substance. It’s pretty much grabbing a text as a launching pad and then whooping and hollering. The people get almost zero education in context, word definitions, etc. The fruit of this type of ministry is evident in the answer to the following question: How many of the church members are serious, effectual Bible students who know how to study the Bible, who know sound principles of Bible interpretation, who know how to use tools such as Strong’s Concordance and Treasury of Scripture Knowledge and a good Bible dictionary? How many of the young people are serious, effectual Bible students? If a church is biblically shallow, it has a weak spiritual foundation that makes it impossible for it to stand against the spiritual, moral, and doctrinal dangers that are encroaching from all sides in this day and time. It might continue to stand for a while out of tradition, but the next generation will fold like a house of cards. - Quick Prayerism. This is an evangelistic methodology that is quick to get people to pray a sinner’s prayer after a shallow gospel presentation and usually without dealing with the necessity of repentance. It is quick to pronounce those people saved and give them “assurance” even if they give no biblical evidence of having been born again. Quick Prayerism is characterized by soul winning reports that are grossly exaggerated, since the number of real, life-changing conversions are small compared to the overall statistics. 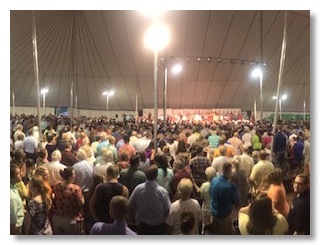 Quick Prayerism was on display at the Burlington Tent Revival when the workers dealt with strangers for a few minutes during an invitation then pronounced these people saved. It is impossible to deal with a stranger properly in 10 or 15 minutes at an altar during a high pressured “invitation” atmosphere driven by hyped-up invitation exhortations and sensual, emotion-driving music. Quick Prayerism is on display in these churches by the way that children are dealt with, in how they are pronounced saved and received into church membership without clear evidence of salvation, and how it is often even looked down on to doubt their salvation later on. - Ignorance about important issues facing the churches. The prophet Hosea bemoaned the fact that “my people are destroyed for lack of knowledge” (Hos. 4:6). This is exactly what is happening in the average Independent Baptist church. There is widespread ignorance about important issues such as contemporary music, New Evangelicalism, the Southern Baptist Convention, Reformed theology, reconstructionism, charismaticism, Neo-orthodoxy, Darwinian and theistic evolution, contemplative mysticism, and the emerging church. The average congregation isn’t well-grounded and properly-taught. Rather, they are shallow and largely ignorant of important issues facing God’s people today. The parents aren’t properly educated by the church so they can effectually train, disciple, and protect their children. This problem is a reflection on the pastors. Not only are they themselves ignorant of important issues, oftentimes they are willfully and boastingly ignorant. When a church member starts getting a proper education and approaches the pastor about various important issues, the pastor isn’t challenged to become a more serious student and teacher. Rather, he treats the church member as a trouble maker. About 15 years ago my pastor rented a table at the Southwide Baptist Fellowship annual conference for two or three years running. He offered Bible study books such as the Way of Life Encyclopedia of the Bible and Christianity and Things Hard to Be Understood and seriously-researched books on issues such as music and New Evangelicalism. Though the books were deeply discounted, there was pathetically little interest by the hundreds of preachers in attendance. The apostle Paul was a passionate student to the end of his life. Even during his final imprisonment he urged Timothy to “bring the books” (2 Tim. 4:13). How far removed the average Independent Baptist pastor is from this godly example, and nowhere is this more true than in the South. Ignorance is a recipe for apostasy. We desperately need preachers who will walk a different path than the typical “southern” traditional style preachers who will be serious students and serious teachers, both of God’s Word and of every issue that is relevant to God’s people today. Serious training material is readily available. What is lacking is the will to pursue this business with sacrificial passion. God’s Word is clear about a preacher’s responsibility in this regard. See, for example, 1 Timothy 4:6, 13; 2 Timothy 2:15; 4:13; Titus 1:10-11; Jude 3. - Entertainment-oriented youth ministries. Instead of serious discipleship and serious Bible training, the young people in the average Independent Baptist church are being entertained to death. Typically, the youth ministry is a Christianized version of the world. It is a lot of entertainment shellacked with a veneer of Bible. At best, the average young person stands on the fence with one foot in the world. His daily life does not reflect passionate love for and obedience to Jesus Christ. If you look at what he loves to do and how uses his free time, you don’t see a real disciple of Christ. You see a worldly young person who knows how to “talk the talk” when necessary. This is the rule, whereas it should be the exception. - Maligning warning and biblical reproof. A friend in the South wrote recently to give the following observation in regard to the Independent Baptist churches he has visited over the years. The all caps are in the original. “I don’t think 98% of Independent Baptist churches have ANY type of warning ministry in their preaching and teaching. … I’m talking about SIMPLE statements of warning here, not a ministry of warning.” My warnings about Burlington were treated as carnal junk and dismissed out of hand. Not only do most Independent Baptist preachers not give clear warnings, they believe that warnings are largely unnecessary and probably wrong. It is typical among fundamental Baptist churches today for godly reproof to be treated as“casting stones,” “shooting the wounded,” “touching the Lord’s anointed,” and other such things, none of which are principles that can be supported from Scripture. A pastor told a friend recently that warnings such as those I give “probably do more harm than good.” This pastor considers himself to be conservative and Scripturally solid, yet he thinks it is harmful to give warnings about preachers who are leading God’s people astray. When warnings are given about something like the downgrade of music standards or shallow evangelism methodology or the error of building an Independent Baptist “friendship unity” on the basis of treating certain biblical issues as “non-essentials,” those warnings are despised and the reprover is maligned. That is a recipe for spiritual destruction. When Israel demanded that the prophets preach smooth things, her downfall was already sealed (Isaiah 30:10). - Soft separatism. Another reason why I am convinced that the average fundamental Baptist church will be well down the emerging path within 10-20 years is the prevalence of “soft separatism.” Soft separatism is separatism that is ineffective to protect the Lord’s people from spiritual dangers. It is characterized by professing to believe in separation but doing things that make the separation ineffective, such as avoiding “negativism and criticism”; avoiding dealing with “personalities”; refusing to issue clear warnings; refusing to distance oneself properly from those who are headed in a wrong direction in order to cut off the leaven of compromise from one’s personal life and family and church; and messing around with dangerous things such as contemporary music, Southern Gospel, and compromised authors. Soft separatists are more concerned about the danger of “disunity” and are more desirous of getting along with the brethren than about standing for the truth, if such a stand proves to be divisive. For more about this see Why Most Independent Baptists Will Be Emerging within 20 Years and The Mobile Phone and the Christian Home and Church, both of which are available in print and as free eBooks from www.wayoflife.org.